Mister Rogers teaching “I like you just the way you are” resonates on Yom Kippur. This summer, I went into a time machine and took a trip back to my childhood. Well, it wasn’t exactly a time machine but rather the movie “Won’t You Be My Neighbor?” The acclaimed film brought me back to the earliest years that I can remember when every day I would watch Mister Rogers’ Neighborhood on PBS. I’m the oldest of three children, and my youngest brother is 10 years younger than I am, so Mister Rogers was a fixture in my home until well into my teenage years. Mister Rogers not only felt like a neighbor. He felt like a member of the family. This year’s film was released on the occasion of the 50th anniversary of the program during our climate of great discord and acrimony in our country. The film reintroduces us to Fred Rogers, who died in 2003, and highlights his example of decency that is needed today more than ever. “I like you just the way you are.” That teaching may seem out of place on Yom Kippur. After all, isn’t today all about change? We tend to focus on how we screwed up rather than how good we are. Furthermore, most of us recognize Yom Kippur as a solemn day when we contemplate our fragility and mortality. We recall our departed loved ones in Yizkor, and we confess our sins in fear of the consequences if we don’t. 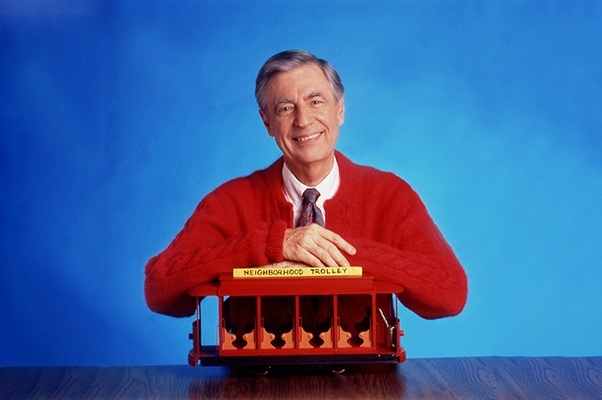 The positive psychology of Mr. Rogers might seem out of place. However, I believe the teaching of Fred Rogers is the essence of Yom Kippur. Yom Kippur is a joyous day. Yom Kippur affirms and celebrates life and cleanses us. When we confess “Ashamnu,” “We have sinned,” it is a hopeful reminder that we can renew ourselves. Rav Kook was the Mister Rogers of his time. For him, reminding ourselves of our good deeds builds self-confidence to venture forward to improve ourselves, the Jewish people and the world. Inspired by Rav Kook, Rabbi Avi Weiss recently composed a prayer that affirms life through noting our positive actions. It supplements the Ashamnu confessional that we say throughout the day to confess the things that we have done wrong. This version of the vidui confessional highlights the things we have done right. We have loved, we have blessed, we have grown, we have spoken positively. תָּמַכְנוּ, תָּרַמְנוּ, תִּקַּנּוּ we have supported, we have contributed, we have repaired. I would like to invite us to do what Mister Rogers asked graduating college students to do: On this important and holy day, let’s pause to think of special people in our lives. Some of them may be right here, some may be far away. Some may even be in heaven. They may be relatives, friends or chance acquaintances. No matter where they are, deep down we know they’ve wanted what was best for us. They’ve cared about us, even through their imperfections, and they encouraged us to be true to the best within us. Let’s take a few moments of silence to think about those people who have cared about us all along the way. As we remember the lives of our departed and the lessons that they taught us, let us honor their memory by taking note of our own goodness that we strive to increase. With all of our faults, let us recognize our inner decency. Let us have the courage to say to our inner selves, “I like you just the way you are.” Let each one of us remember Ahavnu—we have loved, we can love, we WILL love; and through our combined efforts, may God grant each of us the strength to build this world with love.